How Does Color Work For Men? We created this part of the site to help men who have questions about anything color-related. Perhaps you want to do a better job of matching shirts and ties. Maybe you’re (rightly) concerned that you’re not wearing the best colors for your skin tone. There are many reasons you could be here, and we cordially welcome you regardless of what that reason is. 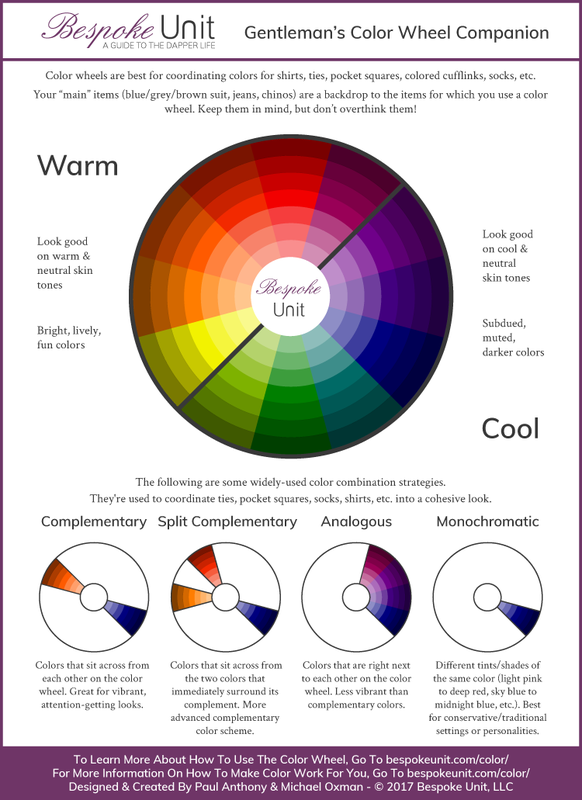 If you’re a natural with color or familiar with some basic concepts already, we invite you to download and print our color wheel (link below) and check out its accompanying infographic (also below). One of the handiest things a man can have hanging in his wardrobe is a color wheel. It’s sometimes really hard to find a few minutes to figure out what tie goes with the shirt you want to wear. 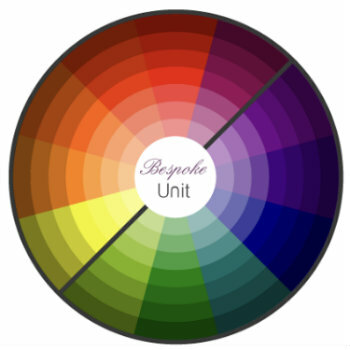 A color wheel hanging on your closet door can be very helpful. We’ve broken the color wheel down in this infographic into warm and cool colors, and have four smaller wheels that demonstrate common color-mating techniques used when coordinating items like shirts, ties, pocket squares, socks, and silk knot cufflinks. While it’s obviously important to consider the color of your main items (jackets and trousers), they don’t often cause much difficulty while dressing. Most men are already sure that their navy suit’s jacket and trouser go together. The confusion occurs when the furnishings are thrown into the mix, so that’s what the lion’s share of the focus is here. Again, the whole objective here is to print this thing off and keep it in your closet for quick reference. 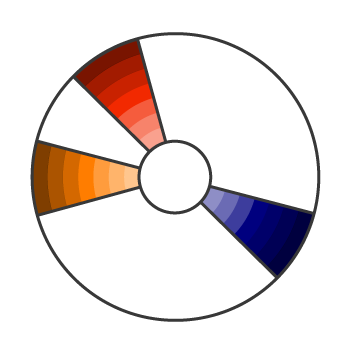 You’d be amazed at how handy a color wheel can be. Now, let’s get into some basic concepts and examples of how to make them work when you’re getting dressed. 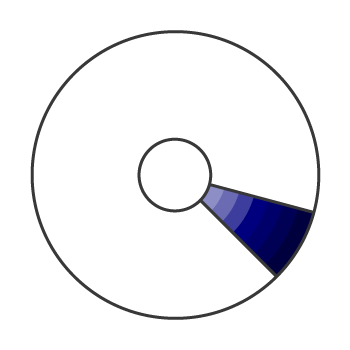 You can see on the large color wheel above that there’s a side indicating warm versus cool colors. We go into greater depth on this concept in “Understanding Skin Tone For Men” (link is below), but from a high level, warm colors tend to be yellows, yellow-greens, oranges, and red-oranges. Cool colors tend to be blues, blue-purples, greens, and teals. Whether or not you should wear warm or cool colors is based on your skin tone. If you’re warm, you’re probably blond and your veins will have a green-ish look to them, and you should wear warmer tones. If you’re cool-toned (and most men are), you probably have pink-ish cheeks and bluish veins, and you should wear cooler tones. Neutral toned men can wear whatever they like. More often than not, these colors are used sparingly in clothes. Scientifically speaking, the eye perceives these colors faster than cool ones (yellow, in fact, travels to the eye the fastest), so too much of these can be a bit of an onslaught. Furthermore, there are fewer warm-toned people than cool-toned, so having these colors near your face can sometimes be risky. On the other hand, a pop of warm color can give you tons of style points when worn as socks, cufflinks, or pocket squares. If you happen to be a person with a warm skin tone, enjoy using these colors as ties, or even as shirts. Cool colors are much easier for most people to flex into their wardrobes than warm ones. 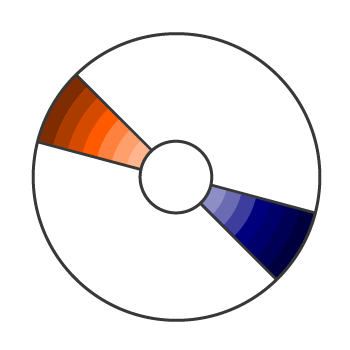 More people than not have cool complexions, so these colors are much more common. This makes them a natural fit for most tailored menswear. We dive deeper into this concept in “How Complementary Colors Work In Menswear” (link is below). Color is not as daunting and fearsome a concept as many of us make it out to be. With even the smallest amount of education on the subject, any one of us can learn to coordinate colors expertly in relation to both our wardrobes and the colors found in our skin, hair, and eyes. Once you’ve got it down, your wardrobe options will expand immensely and you’ll look better than you ever have. Please enjoy these resources, and as always, send any questions our way in the comments section. Here’s to all of us being better-dressed men! Thank you for this straightforward article! Thank you for your kinds words, and comments. I’ll talk to the team, and make any changes to be more inclusive.